These delicious tots are crispy on the outside and gooey in the middle. I have a new found appreciation for spaghetti squash. I really can’t believe I went most of my life not knowing how magical it is. If you’re not familiar, once it’s baked, it breaks apart into little strands that can be eaten as a healthy pasta substitute, OR, in this case, an amazing alternative to potatoes! I’ve made broccoli tots a few times in the past and they’ve always been a big hit, and so it got me thinking…. what other kind of veggie could I toss together with bread crumbs, eggs and cheese to create crispy little bites of goodness? 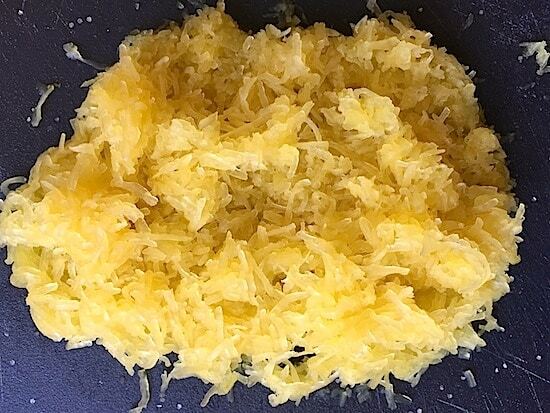 How about spaghetti squash! I have to tell ya, these baked spaghetti squash tater tots turned out 10 times better than expected! They’re crispy on the outside, a little gooey in the middle, and super tasty. The spaghetti squash is also packed full of a lot more nutrients than potatoes, so I think we’ll just go ahead and consider this a healthy snack. 2. Chop your spaghetti squash in half, core, and bake with the flesh side down on a baking sheet for approximately 45 minutes (pictorial below, however you can skip the olive oil for this recipe). Let it cool for about 10 minutes before breaking apart the strands. 2. Measure out approximately 2 cups of spaghetti squash strands (you will probably not use the entire squash depending on the size), and then squeeze as much water out of the strands as you can. I just put the strands in a large measuring cup, and then push down on them with the back end of a large spoon, and slowly drain the water out by tipping the cup over the sink. 3. Roughly chop the squash strands up into small pieces. 4. Combine all of your ingredients into a large bowl (parmesan, eggs, panko, squash strands, and seasoning), and mix with a spoon until well combined. 5. Use your hands to form tater tot sized cylinders, and place them on a foil-lined baking sheet. You should be able to make about 30 tots. 6. Bake at 400 degrees for 15 minutes, flip, and then bake for an additional 8-12 minutes.